Working with an unlicensed contractor or vendor is not advised and often reminds one of an old saying “penny wise, pound foolish.” While the potential for a lower price may sound appealing it could end up costing you more in the long run. Before hiring a contractor, vendor, or professional for a remodel, building project, or a repair, you should ask for proof of license and insurance. 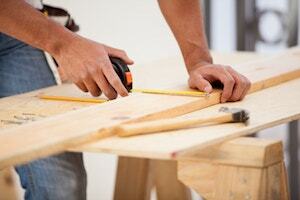 You want a contractor who carries both liability insurance and workers’ compensation coverage. This protects you from any damage to your home or property and if the contractor or any of the employees, or their third parties are injured on the job, you are covered; otherwise you could be liable for expenses. You should also see if your contractor is bonded. Bonds protect homeowners if the company performs shoddy work, doesn't finish the project, or fails to pay subcontractors and suppliers. There are many things that could happen if you hire an unlicensed contractor beside losing money. The contractor may not be qualified to do the work, may provide inadequate workmanship, they could halt the project or even stop the project (unfinished work), and then go missing. Improper installation could impact warranties or future insurance claims. The vendor may not pull required permits which then you would be responsible for all costs, fees, and any potential rework. It could also impact the future sale of your home or businesses. Permitted work is subject to inspections during the process that verify work is completed correctly and up to code. If your contractor is not insured and they or an employee is injured on the job, you would most likely be sued for all medical bills and their lost wages, which then could also increase your own insurance premiums. And, in some instance and in some states, A contractor may place a lien on your property if they are not paid for work completed. Lucky for Floridian’s, there is a lien law which says that a contractor who is unlicensed, as required by state statute, cannot enforce lien rights. In Florida, there are many businesses and professionals that need to be licensed such as members of the construction industry, electric and alarm contractors, landscape architecture, mold related services, and more. To see a list of services, establishments, or individuals that may require a license, click here. No license number in advertisement or posting. By law, contractors licensed by DBPR must include their license number in all advertising. They request up-front payments and will only accept cash. They may also want you to write the check to them individually or to “cash”. They give you a post box office address instead of a street address. They show up in unmarked vehicles offering to do work and often have out-of-state tags. They try to convince you a permit is not necessary or that it’s cheaper if you obtain it yourself. Unlicensed contractors often target the uniformed and inexperienced as well as the elderly. Look for someone who is licensed, bonded and insured, someone you are comfortable with and can communicate well with. Your contractor should provide you with a comprehensive contract, a reasonable payment schedule, and references. Licensing law may vary by state. Please make sure to check your state’s requirements and verify contractor licensing before hiring. If you are considering hiring a contractor in Florida, verify their license by visiting www.myfloridalicense.com or calling (850) 487-1395.